This award winning game is easy to learn, with simple mechanics. However, each move will keep you adjusting both strategy and tactics to try and finish with the most points! Availability: For demo and sale at the Game Shop! Contact us for details! 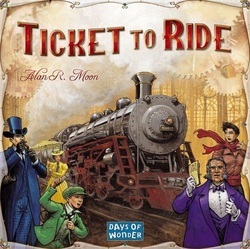 This popular game has become the most well known modern board game amongst players. 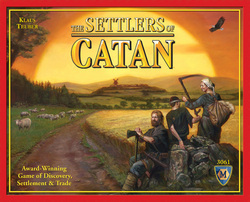 Catan is very easy to learn and requires a bit of strategy to play. As resource building game, all you need to win is wheat, sheep, wood, and brick! Game Play: Each player begins by strategically placing roads and settlement pieces on the board. Advancement is determined by rolling the dice and receiving resources based upon the number rolled and the placement of your pieces. If you are on low yielding spaces, it can be difficult to get what you need but don't worry! Just as in real life, you can barter with players to get what you need. However, sheep may cost you more wood than you bargained for! The first settler to expand their territory to ten points, wins! Availability: For demo and sale in the Game Shop! Have you ever explored a haunted house? This game lets you do just that! With a group of misfits, explore a haunted mansion. Danger and suspense lie around every corner and watch out, that thing that goes bump in the night, just might be you! Game Play: This is a tile building game that starts with only a few spaces on the board. As you explore the mansion, new rooms are drawn and placed into play. Your character uses certain traits to execute events, use items, and interpret omens throughout the game. Each omen uncovered adds to the chances of a real haunt happening to you and your group. Depending on the place and omen that trigger the haunt, characters battle for their lives in one of 52 different scenarios, most of which include one of the explorers becoming a traitor! Whoever accomplishes what they need to defeat the other, wins. Availability: For demo and sale at the Game Shop! Looking for an easy cooperative game? You've found it! Simple to learn and lots of excitement, this game is quick and easy for all ages. Game Play: This game starts with each player receiving cards to help defeat monsters place in a radius around a castle. As play progresses, drawing and trading cards allows the whole table to strategize and defeat monsters before they can overtake the castle. But beware! Each round there is the possibility for another horde to start their attack. If the players can successfully defeat all the monsters in the game before there castle falls, they win! Availability: For demo at most Castle Games events. Special order available. Contact us for details! Remember that toy where you can build roads, rivers and railroads out of tiles? That is what this reminds us of! Earn points by building an empire and claiming it for your own! Availability: Special order available. Contact us for details! Sick of always trying to save people? Then this game is for you! 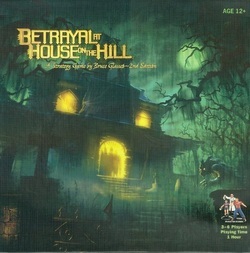 Instead of making everybody hunky-dory, this Edward Gorey-esque game is a race to depress then kill your entire family! Game Play: Start by selecting a family. Then slowly put them is a terrible mood from unfortunate mishaps. Once you collect the right cards, go ahead and put them out of their misery! This game is a race to depress your own family while preventing others from doing the same. You can then kill your family off for as many points as possible, or kill your opponents family before they collect too many points. Once one family is wiped out, add up your score and the most depressed family wins!